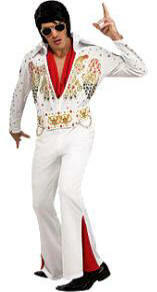 The Elvis Aloha costume is possibly the most recognizable Elvis costume. 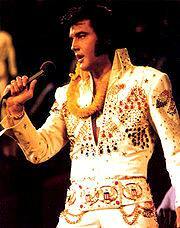 This Elvis “Aloha” jumpsuit costume was first worn for the landmark Elvis television special “Elvis Aloha From Hawaii” on January 14, 1973. 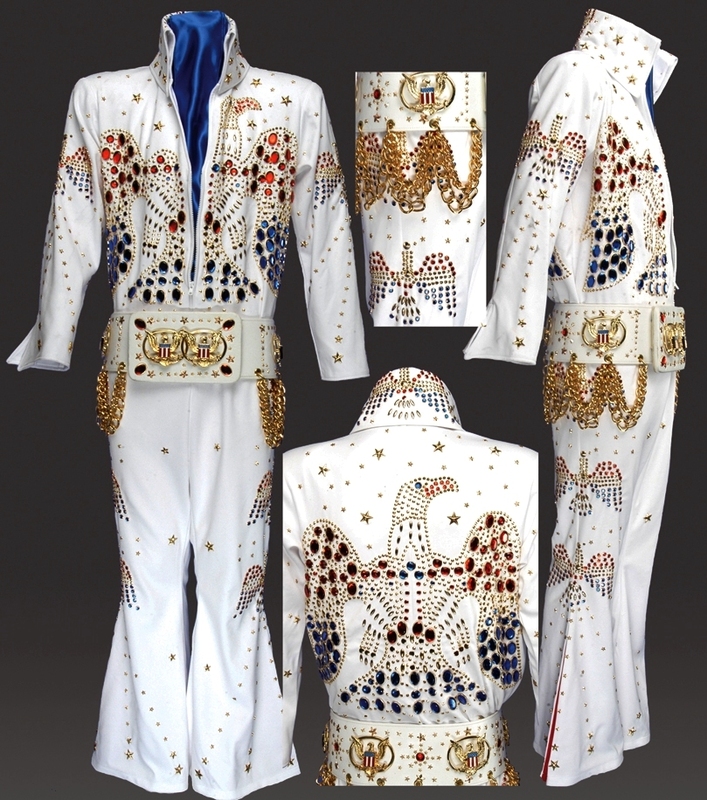 Bill Belew designed the white Elvis "Aloha" Eagle jumpsuit costume to signified America with an American Eagle patterned in red, gold, & blue gems. 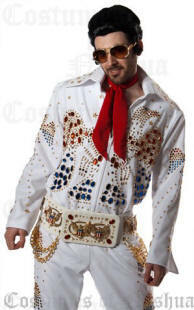 The costume was accented w/a belt decorated with gold American eagles. 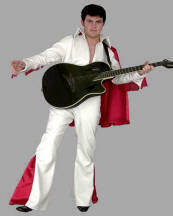 A spectacular calf-length cape proved to be too cumbersome during rehearsals, so Elvis ordered a hip-length cape to replace it. 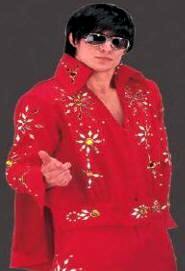 During the show, Elvis threw the belt into the audience & later threw the cape into the cheering crowd as he finished the closing song. 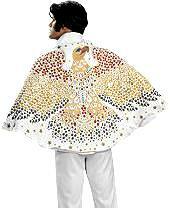 Elvis ordered a second cape & belt for later performances. 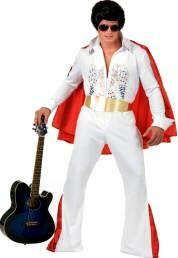 By the end of 1974, Elvis stopped wearing capes onstage. 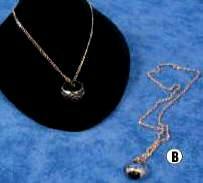 Not only were they heavy & uncomfortable, but members of the audience tended to grab the edges of them while he was performing, resulting in some near accidents. 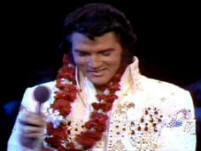 The show was the most expensive entertainment special at the time, costing $2.5 million. 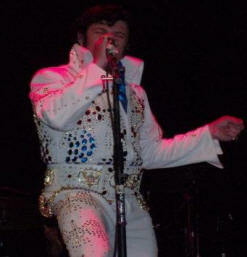 '68 Comeback Special Elvis Costume. 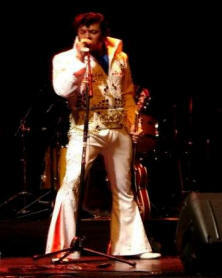 Elvis wore the '68 Comeback Special Elvis Costume in his comeback concert “Elvis”. 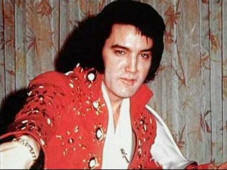 It aired on December 3, 1968 on NBC-TV, and is commonly referred to as the '68 Comeback Special, because of subsequent developments in Presley's career. 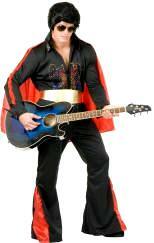 This is an authentic licensed Elvis Costume. 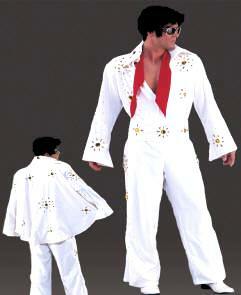 Before Elvis wore White Jumpsuits he wore the Elvis Gold Lame Costume. 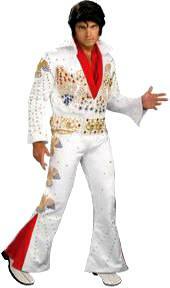 Elvis wore this complete Gold Lame Costume Tuxedo only once. 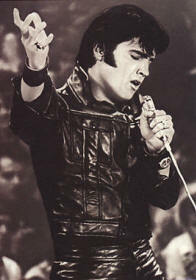 It was featured on the 50,000,000 Elvis Fans Can't be Wrong album cover, which was released in 1959. 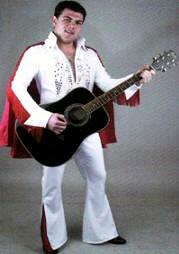 Elvis was reluctant to wear the full lame gear & only wore the jacket once more in an appearance. 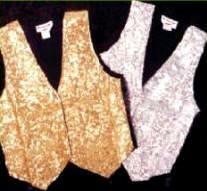 The Gold Lame Costume Tuxedo was designed & produced for $10,000 by Nudie Cohen of Nudie Rodeo Tailors in North Hollywood, CA. Includes: Set of 3 scarves. 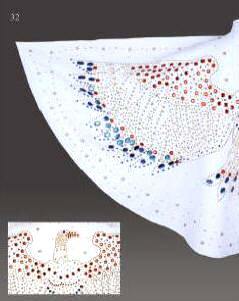 Please note, the eagle and jewel detail is silk screened & is not separate jewels. 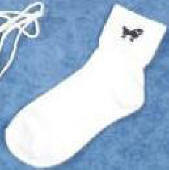 Discontinued by manufacture & no longer available. See below for other options. 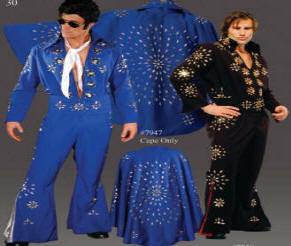 Star Costumes, not licensed Elvis Costumes. Click here for more pictures of this costume. Same as Above Back view. 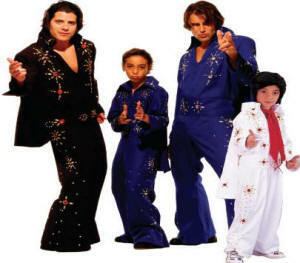 Includes: Jumpsuit, cape & belt. 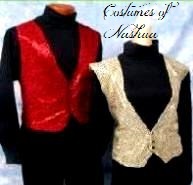 Includes: Gold lame high collar, sequin trim waist length jacket, matching pants & boot tops. 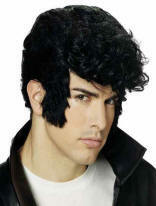 Great for Bye Bye Birdie. 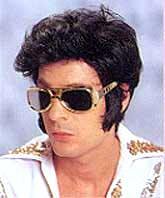 This is the look that brought Elvis back to stardom on his Television Special in 1968. 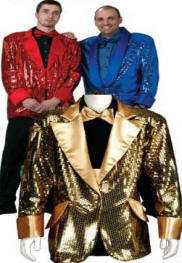 Includes: Front snap faux leather jacket accented w/high collar, silver buttons, sleeve cuffs, 2 chest pockets & matching pants. 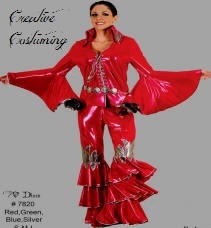 Includes: Jumpsuit decorated w/textured clusters of diamond shaped studs w/red satin showing through eyelet holes @ front neck & collar, red satin insets at side pants accented with matching cape and belt.  Same as Above but in blue. 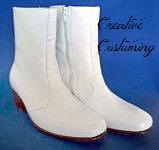 100% leather upper, soft cowskin leather lining for comfort, 100% leather soles, 1.75" cuban heel, side zipper for convenience. 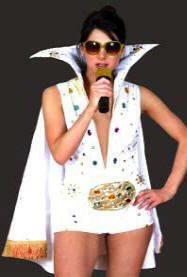 Includes: White jumpsuit w/attached cape accented with gold metallic trim, red trim on chests, arms, legs & chest & gold belt. 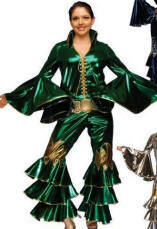 Includes: Nylon knit jumpsuit & vinyl belt both heavily detailed with gold metallic trim & Chiffon neck scarf. 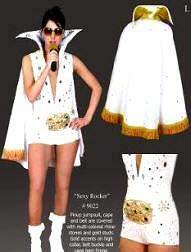 Includes: White jumpsuit w/red trim on legs, red fringe on arms, & gold vinyl belt. 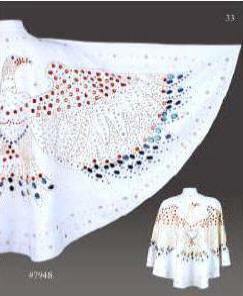 Includes: White jumpsuit with jeweled Eagle, belt & red cape. 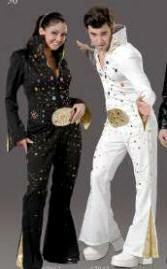 Includes: White Jeweled Double Knit Poly Jumpsuit & Jeweled Belt. 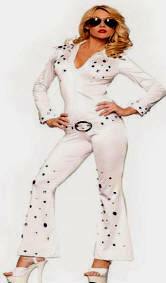 Includes: White Jeweled Double Knit Poly Jumpsuit & Belt. 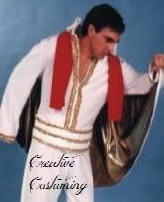 White cape of heavy polyester with liquid gold lame lining and velcro tabs at shoulders. 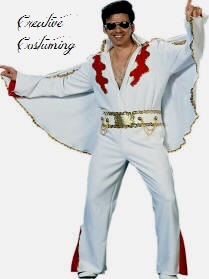 Includes: Pinup Jumpsuit & Belt covered in multi-colored rhinestones & gold studs, Cape covered in multi-colored rhinestones, gold studs & hem fringe, high collar with gold accents, elaborately decorated belt buckle. 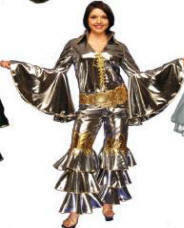 Includes: Stretch lycra belted jumpsuit decorated w/multi-colored jewels & sunglasses. 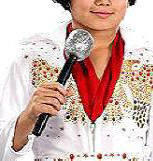 Includes: Double Knit Poly zipper front jeweled jumpsuit, jeweled belt & headset microphone. 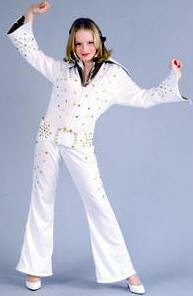 Lucille Ball was one of the most popular stars in America during her lifetime & had one of Hollywood's longest careers. 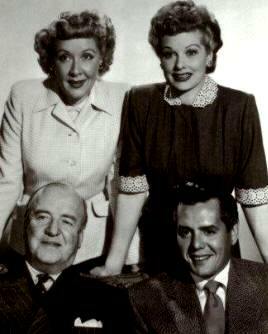 I Love Lucy, the landmark television series Lucille Ball co-created with her husband Desi Arnaz, has been in syndication since its first broadcast in 1951! 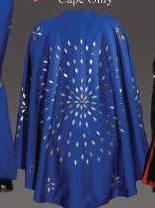 Includes: Semi-fitted bodice dress w/mid calf length circular skirt & separate apron. Front button closure. Includes: Grey/Black Houndstooth Check Suit Jacket & Black Pants. Includes: Grey Jacket, pants & bus driver hat. over excited crowd present during filming. Includes: Seductive halter dress w/lined sunburst pleated circular skirt, elastic at waist & back bodice for better fit, double layered bra for better coverage. Includes: Flirty halter dress for full figured ladies w/lined sunburst pleated circular skirt, elastic shirred back bodice for comfort & size flexibility, double layered bra for better coverage & matching long sleeve bolero jacket. 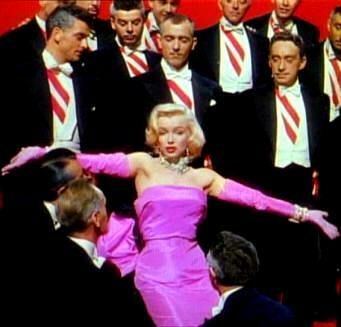 Arguably one of Marilyn Monroe’s most famous dresses, the Pink Satin Marilyn Monroe Costume worn in the musical number “Diamonds Are A Girl’s Best Friend” from the hit motion picture How To Marry A Millionaire. 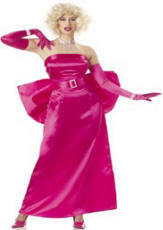 Includes: Satin Gown, Belt w/Jeweled Buckle & gloves. order form. Accurate measurements are imperative! please include your chest & waist measurements on the order form. Dark Lens. Large Size Frame. Color: Silver Frame w/Dark Lens. 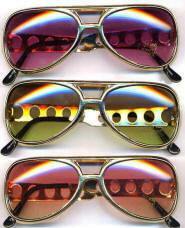 Color: Silver Frame w/assorted lens. 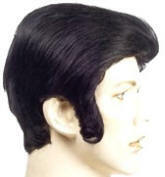 Great for Elvis & Theatre. 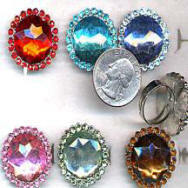 Color: Red (shown) or assorted. 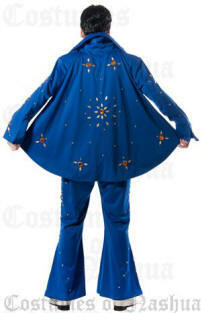 Limited Available for purchase Size M or L.
Includes Stretch sequin gown w/built-in bra & marabou feather trim. 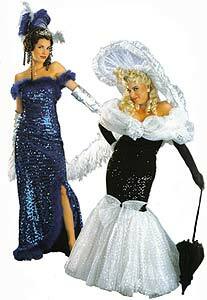 Includes: Large white tulle picture frame hat, stretch sequin gown with built-in bra and silver tinsel on white tulle ruffles. Servin' it up hot! She's serving up retro delight in this vintage inspired number. 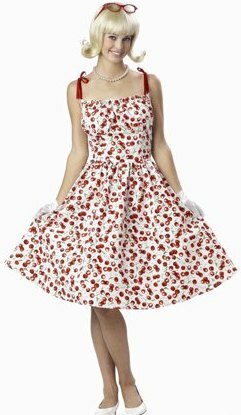 Includes: Red & white striped dress with three tiered ruffled skirt with ruffled neckline, puff sleeves, back zipper closure, attached screen printed apron, "Cherrie" written on a diner inspired name tag & matching headpiece. 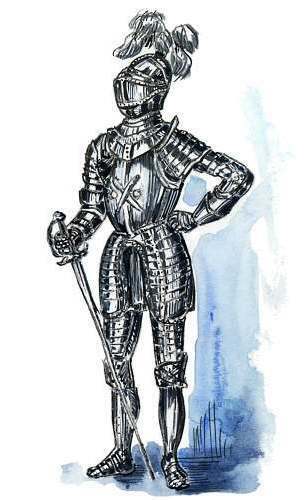 Please note: Costume is very short & should be worn with a petticoat. Shoes, Tray/Ice Cream & Petticoat not included. XL - 3XL add $10. Care Instructions: Machine Wash Cold - Tumble Dry Low. it home to today with its alluring cut. 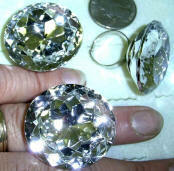 You will definitely be the center attention! Easy care wash & wear design. 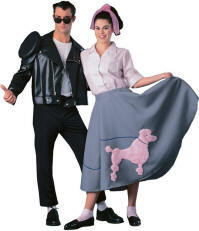 Poodle Skirt Size: One size elastic waist. 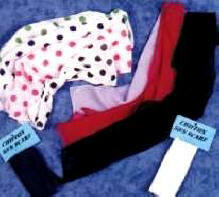 They stretch from 22" to 52" waist & are approximately 26" in length. 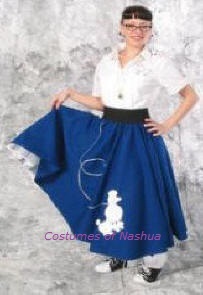 Different color blouse, belt, socks, glasses, poodle, petticoat or scarf may be substituted, (based on availability). 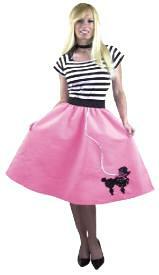 Twirl yourself back to the Fifties in this heavy ponte' knit, full circle skirt. Includes: Skirt accented with black elastic waistband (looks like a belt) & removable fur poodle applique & a sequin leash on the front. Includes: Chiffon Scarf, poly-crepe blouse & poly-poplin skirt. 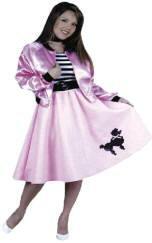 The large pink poodle on the skirt gives an authentic 50's feel. 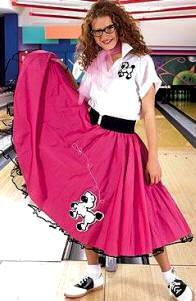 Includes: Top, Felt Skirt with Poodle Patch & Gold Sequin Trim & scarf. Same as above but Plus Size. 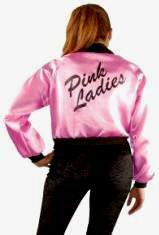 Catch your guy's eye w/a Pink Ladies Jacket. 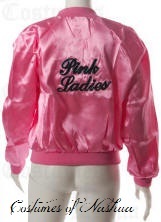 Includes: Pink satin jacket with Pink Ladies patch on chest of jacket. 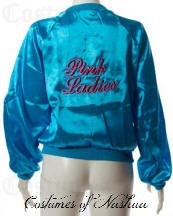 Includes: Pink satin jacket with Pink Ladies on chest of jacket. 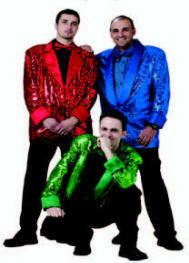 Colors: Black, Pink, Red or White (shown). Stretch belt with feathers and rhinestones. This is a great reproduction of an old classic. 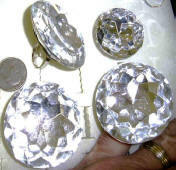 Perfect finishing touch for that poodle outfit or any 1950's costume ensemble. 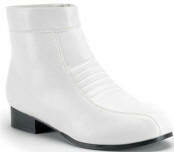 Click here for more shoe styles. 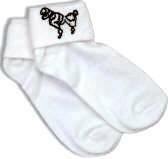 Includes: White cotton sock with black satin poodle. 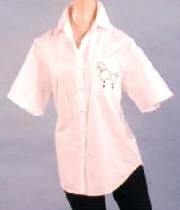 Color: White (shown) w/Pink poodle. 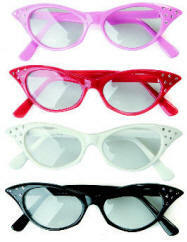 Get your "geek" on with these bold, "old-school" style horn-rimmed glasses. A look so dated that it’s hip again! The Rock Star Tribute by Marco in Columbia. performing in our Aloha Suit. Purchase information at the top of this page. Available for rental @ $25. Size 9 available for purchase @ $149.99.